Video clip synopsis – The people of Tonga prepare to mark their King's birthday and 25th anniversary of his reign. Broadband MP4 royal_bb.mp4 (16.4MB), suitable for iPods and computer downloads. 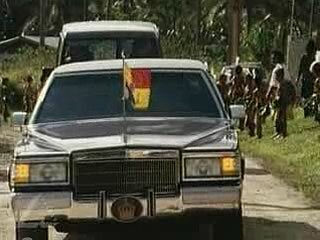 Royal Tongan Celebration is an excerpt from the documentary Fit for a King, made in 1994. An intimate portrait of the King of Tonga, ruler of one of the smallest monarchies in the world. Filmed during the elaborate celebrations for his 75th birthday and the 25th anniversary of his reign, it shows King Taufu’ahau Tupou IV as a revered figure in Tongan society. The film also looks at the question of democratic reform as the country changes and modernises, and the people of Tonga speak about their future. A Titus Films Production made with the participation of the Australian Film Finance Corporation Pty Limited. A case study of the monarchy in Tonga can enhance students’ knowledge and understanding about the concepts of leadership and democracy by comparing a twentieth century ‘feudal monarch’ with leaders in ancient and medieval times. Explore the key concepts of democracy, governance, the rule of law, justice, religion, liberty, authority, leadership, culture and feudalism. Explore the values and beliefs of societies through their religion, myths, legends and their social and political structures. Examine the ways culture is expressed through art, music, literature, drama, festivals and education. Explore the origins of democracy. Civic and Citizenship – Concept of democracy, personal identity, leadership, knowing rights and responsibilities as a citizen, human rights, social justice. Governments as global citizens. Appreciate Australia’s place in the Asia–Pacific region and the world. In 1845 ‘The Friendly Islands’ (the name given to Tonga by Captain Cook because of the friendly reception he received) joined and became firstly a Polynesian Kingdom and then later, in 1875, a constitutional monarchy. In 1900, the Kingdom became a British protectorate and was so until 1970 when it became the independent Kingdom of Tonga, the only monarchy among the Pacific nations. As a constitutional monarchy, Tonga has enjoyed stability and relative prosperity for many decades with its citizens having high rates of adult literacy and longevity. King Taufa’ahau Tupou was much revered by his subjects and under his rule people enjoyed stability and prosperity. Despite his popularity, there was a questioning about the system of government during the latter part of his reign. In Tonga power and privilege are inherited. A pro-democracy movement argues that as Tonga modernises and changes, so too should the form of government include more participation in decision-making by all of its citizens. Modernisation and change has included Tongans migrating in large numbers seeking work and better wages and increased engagement in the globalised economy. With this wider experience the social aspirations of many Tongans began to change. The pro-democracy movement in Tonga has in recent years become strengthened. In 1998 the Tongan Human Rights and Democracy Movement (THRDM) was formed and called for democratic changes including the creation of an Upper House for nobles while making 21 seats in the Lower House directly elected by and open to commoners. No longer relegated to the margins of Tongan society, the THRDM’s influence is being felt at all levels of government, though reform has been very gradual. In the 2005 elections, eight of the nine commoner seats in the Lower House were won by members of the new party. This video clip comes from the documentary Fit for a King made during the lavish 75th birthday and 25th anniversary celebrations of the reign of King of Tonga, King Taufa’ahau Tupou IV in 1994. Celebrations were held throughout the kingdom and people paid their respects to the King. King Taufa’ahau Tupou IV died on 10 September 2006. His 41-year reign made him one of the world’s longest-serving sovereigns. He was succeeded by his eldest son King George Tupou V. Tonga continues to experience change and political uncertainty. Research a definition of a ‘feudal monarchy’. In your Humanities studies you may have explored the idea of medieval feudal monarchs in Europe. If so, revise the key features of the feudal system of governance. If not, research some examples of monarchs of medieval Europe, noting the major characteristics of their style of rule. Now research a definition of a ‘constitutional monarch’. Using data from the video clip, list the features of leadership of the late King Taufa’ahau Topou 1V of Tonga. To what extent do you agree with the comment made by the filmmaker Nick Adler in the video clip that the king is a ‘feudal monarch’? Or is he a ‘constitutional monarch’? Can he best be described as being both of these types of rulers? Tonga’s new monarch King George Tupou V will undoubtably face some of these leadership issues. Research recent newspaper or internet articles to discover how Tonga is dealing with the advent of a new monarch. What is meant by being a ‘noble’ in Tonga? List the noble’s duties and responsibilities? How do you become a noble’ in Tonga? Are all nobles male? Is there a similar person in your local community in Australia today? Explain why you think this position does/does not exist? In small groups, draw up a list of what you think are the characteristics of a good leader. Then, using data from the video clip, construct a list of advantages and disadvantages of the type of leadership the late King Taufa’ahau Topou 1V gave the people of Tonga? Other groups should try to investigate the duties and responsibilities of other leaders, for example, the Prime Minister in Australia. As a concluding activity, evaluate in a class debate, which style of leadership is better? A meeting of a local village community has been called in Tonga to discuss the issue of a more ‘democratic’ form of government. At the meeting are several groups of Tongans – nobles, members of the armed forces, people living in towns near the capital, some Australian Tongans who are visiting Tonga on a holiday, people living in outer islands, some young people who have just returned to Tonga after several years overseas and foreign owners of several tourist resorts in Tonga. Form groups representing the above groups at the meeting and prepare a speech to be given at the meeting. Appoint a person to chair the meeting. Ask the chairperson and several assistants to consider the presentations and to make summary recommendations.